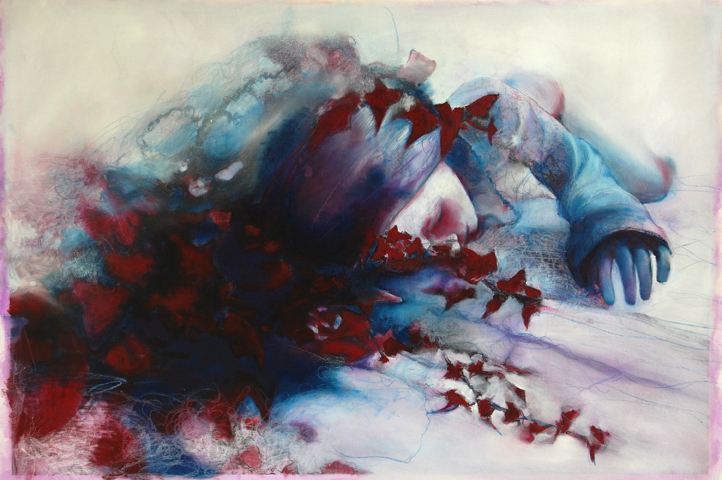 Ophelia, Barbara Agreste Paintings and text about Catharsis. Art curators, and also other people have said that my images in my “Nigredo” series are inspired to the myth of Ophelia, and it is true. Ophelia is the famous character from Shakespeare‘s poem “Hamlet”, and she is mysteriously found dead in a pond – or a small river, actually a brook. According to The Queen Gertrude, another character from the Shakespeare’s poem, Ophelia was “incapable of her own distress”, but she died because, after having climbed on a willow tree, a brunch broke and she fell into the river and drowned. Now, there have been many portraits and representations of drowned Ophelia throughout the time, and this theme continues to be of great interest to artists today. How do my images connect to Ophelia? 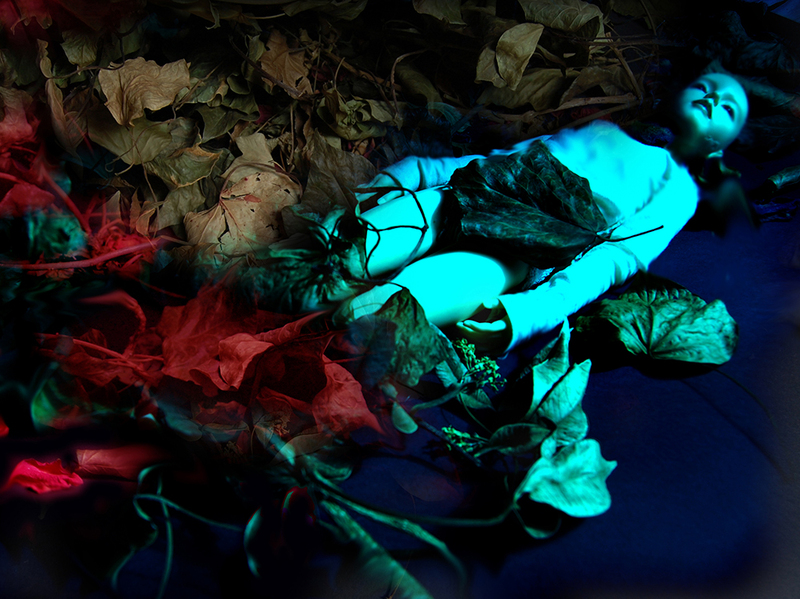 I have taken a doll and put her beside some leaves and branches, sometimes she is depicted close to a pond of blood, some other she is just lying as if asleep. There is this connection between death and sleep, the eyes are closed therefore it is either sleep or death. But there is a state of conscience in between death and rest, and that is best described in the alchemy phase of the “Nigredo”. Nigredo, or blackness, in alchemy means putrefaction or decomposition; but Carl Jung interpreted Nigredo as a “moment of maximum despair, which is a prerequisite to personal development”. But even alchemists consider Nigredo only a phase, a passage in time, followed by other stages of transformation of the matter, like those of Albedo (whiteness) and Rubedo (redness), that means that after Nigredo, which could be interpreted as a time of incubation and the detachment of dark matter, there is always resurrection, a phase of rising: rebirth. Ophelia drowned in the pond, we know that. What I am representing in my images is connected to Ophelia’s character because we see a female body lying down, and she still looks human, she is not a putrefactive body yet. The representation of beauty is recurring for what regards Ophelia’s portraits throughout history; she is depicted as beautiful surrounded by flowers, both when she’s alive and in death. the only difference is that, as opposed to what Jung says, she does not come back, after this time of incubation and catharsis, as a more grown individual, because she drowns while pain and “dark matter” come out of her. Ophelia dies because of pain, that is a possible interpretation of her tragedy. My dolls contain the theme of Ophelia, whether the outcome of distress is death or not, they suggest immobility out of a phase of catharsis. The doll is another strong connection to Ophelia: a doll is first of all not a real human being, it is an object, it is already dead. A doll immediately recalls death because of its stillness: it is the uncanny resembling of the human, but without a soul. The doll is a way for me to symbolize the real being, as all other objects are, they serve a scope, which is that of placing what’s inside at a distance from the self, reconstructing a place of things that happened, or that are happening, helping me to put in a separate picture the slippery surfaces and facets of the unconscious. Ophelia is a figure that belongs to all of us because she represents an obscure side of the human, she trespass the threshold of life, and this “going beyond” is present in everyone in the farthest corners of our existence as a last resort to death as a possibility or alternative to pain. 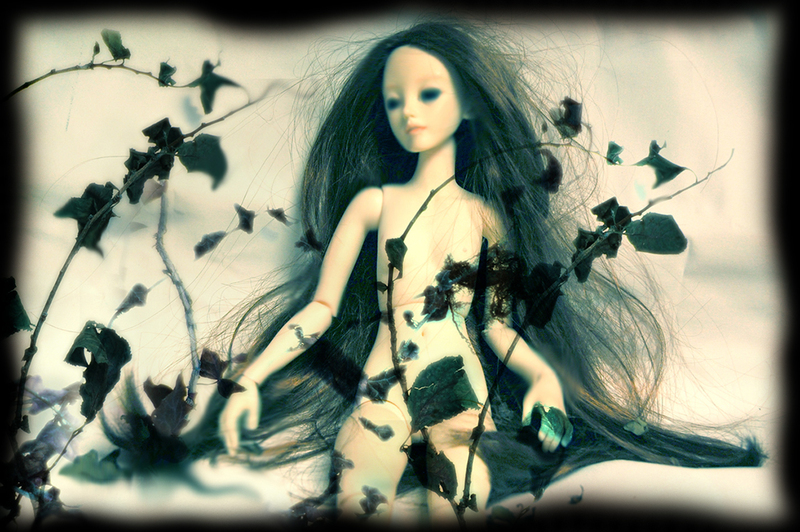 Another association with Ophelia is the fact that there are always a lot of branches and leaves close to the doll. Why is Ophelia often represented with her body decorated with flowers? One answer could be that the woman’s body is very much connected to nature, the earth and the vegetation are the symbol of life like woman is. Therefore Ophelia, when she sees no alternative for her state of confusion in the rational world, the world of culture, she turns to nature, the plants and the river are something to wear, and nature is the last confortable asylum. 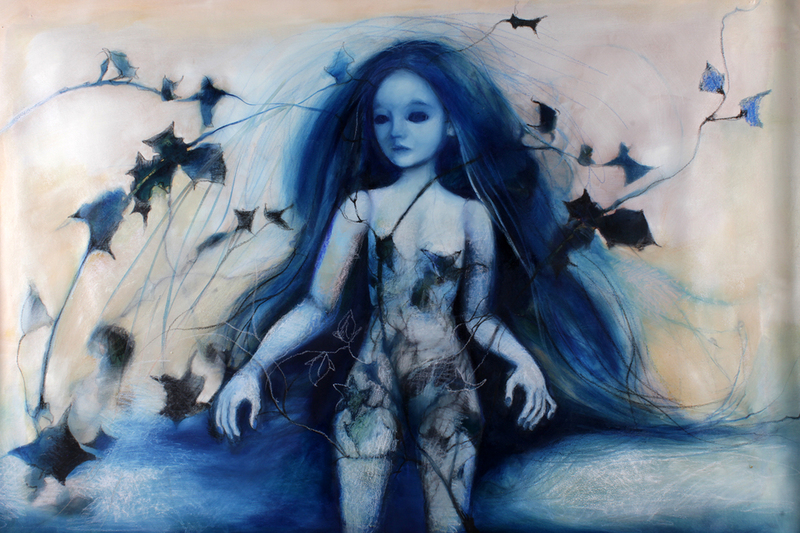 But in my artwork nature is not an healthy asylum anymore, it is rather in a terminal state as the figure of Ophelia is. I often have turned the water of the pond into blood, or a blue lake; poison is all over the ground in my images, and peraphs the doll is there grieving for it or agonizing with it. The poisoned earth is a contemporary issue, and one more reason to depict the death of women. To go deep into this argument about poison I am going to take you to my next essay about my video “Cyanide“. Ophelia – I like the valuable info you provide in your articles. I’ll bookmark your blog and check again here regularly. I am quite certain I’ll learn lots of new stuff right here! Fantastic Content! I appreciate your content. You provide Very informative material. This interpretation of Ophelia is very original. I update it almost everyday now, I’m adding a lot of new pages. I have to agree with you on most parts of what you said about Ophelia, but in the end we’ll disagree. I’ll arrive back later and see what you say. Hrmm that was weird, my comment got eaten. Anyway I wanted to say that it’s fine to be aware that somebody else also mentioned that as I had trouble finding the same info elsewhere. That was the first place that told me the answer. Thanks. That is a really fine read for me, Must admit that you are one among the greatest bloggers I ever saw.Thanks for posting this informative article about Ophelia. You really make it seem so uncomplicated with your presentation but I find that topic to be really something that I think I would by no means understand. It seems too complicated and really broad for me. I am looking forward for your next post, I can try to get the hang of it! Substantially, the post is really the sweetest on this precious topic of Ophelia. I match in with your conclusions and will eagerly look forward to your coming updates. Just saying thanks will not simply be sufficient, for the amazing lucidity in your writing. I will at once grab your rss feed to stay abreast of any updates. Genuine work and much success in your business efforts! Barbara Agreste © 2000. All Rights Reserved.